Thriller Books Journal is pleased to host Sarah Ward, author of In Bitter Chill, a fascinating crime fiction debut set in a small community in the Derbyshire Peak District. [Q]: Hello Sarah, nice to meet you and thank you for joining us. Let’s start with some background: was writing fiction your first professional calling, and if not, how and when did you start writing? [A]: Hello and thank you for having me on your website. Like most writers I’ve done a variety of jobs. I wrote professionally in the public sector and have also taught English as a Foreign Language abroad. I started writing while I was living in Greece. I’d read crime novels since I was a child and had also been reviewing them for around eight years including on my blog, Crimepieces. It felt that the time was right to start my own book. [Q]: ‘In Bitter Chill’ is set in a small town, peopled by ordinary people and policed by ordinary coppers. What attracted you – besides the obvious beauty of the Peak District – to this type of setting? [A]: When you’re a writer there’s a pressure to make your characters as interesting as possible. This is, of course, essential but I think ordinary people can have extraordinary stories and I wanted to reflect that in my writing. I grew up in a small town: one high school, a single doctor’s surgery. In these places a lot can happen! [Q]: Family histories are a strong feature of your novel: they’re narrated, dug into and laid bare, providing fuel for both criminal acts and their investigation. Do you share your protagonist Rachel Jones’ interest in genealogy, and if so, why? [A]: I’m fascinated by family histories both oral and written. I’ve never investigated my own as I have relatives who are doing this very well themselves and have found out very interesting insights into my family. I did do a little research into the matrilineal line as that’s a focus of Rachel’s researches but only so I could see what you needed to do to get hold of a birth certificate and so on. My interest in families is in the stories they hold and, in particular, the secrets they hide. [Q]: One of the novel’s many fascinating features is that it gives voice to both victims – Rachel Jones was abducted as a child, an event that ended in tragedy for her friend Sophie – and the bereaved, through the suicide of Sophie’s mother. Would you like to comment on this? [A]: I think modern readers are no longer satisfied with just focusing on a crime. They also wanted to know the impetus behind it and the impact that a trauma has on the people involved. I think people do, usually, cope with trauma well but can also be damaged by it. Rachel, despite her kidnapping, becomes a fully functioning adult. Sophie’s mother, despite her suicide, copes for a long time. I strongly believe that people are survivors. [Q]: The lead investigators, broody, smart DI Francis Sadler and young, keen DS Connie Childs are an interesting pair of detectives, and certainly not in the Holmes-Watson mould. Were you inspired in their creation by any other sleuthing ‘pair’, fictional or otherwise? [A]: I’m not sure that I saw them as a pair. I was keen to have a male senior detective as my main protagonist, Rachel, is female. There’s a strong sense of women’s history in the book and I wanted to balance this with a man leading the case. I love sleuthing pairs but if I was influenced by them it was unconscious. [Q]: ‘In Bitter Chill’ is also a story about concealment, engineered by the passage of time and by the deliberate actions of its characters. As a crime author, how do you decide what to keep from the reader – if anything – and what to reveal? [A]: I tend to put myself in the shoes of the person who is unravelling the mystery. At what point should the police realistically be discovering things? At what stage would Rachel want to intervene in her own story? But at the same time, when the book is completed, I do need to check that I don’t reveal too much too soon. [Q]: You also publish an excellent crime fiction blog, CRIMEPIECES. Do you have a favourite crime fiction subgenre, and if so, why? [A]: I would say Nordic noir as I’m also a judge on the Petrona Award for translated Scandinavian crime fiction. There are some excellent writers from the Nordic countries and I love reading their books. I like the strong sense of place and focus on characterisation. 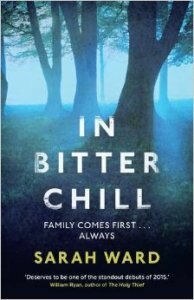 [Q]: ‘In Bitter Chill’ is almost canonical as a British police procedural, yet you also appreciate crime fiction in translation: why, and is there any author you particularly think UK readers ought to look out for? [A]: I like the slant that translated crime fiction can give on the genre. One of my favourite writers is the French author Fred Vargas. She has a humorous slant on the world that I appreciate but could never replicate. 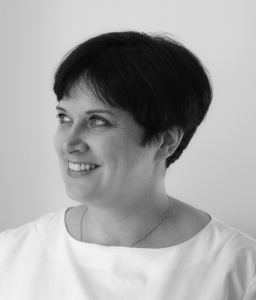 TBJ: Thank you very much for your time and your insight Sarah, and we look forward to reading more of your work soon!